Online retailers may have outed details on EA and BioWare's ambitious massively multiplayer online game, Star Wars: The Old Republic, specifically its pre-order plans and its equally massive Collector's Edition, a few days earlier than expected, much to the delight of Star Wars fans. Polish retailer Empik posted (then pulled) details on the Star Wars MMO's pre-order date, July 21. Spanish retailer XtraLife similarly offered fresh details on the The Old Republic's pricey Collector's Edition. Here's what that more expensive option (rumored to be priced at €149.95/$175 USD) includes, according to associated artwork. STAP: Sleek and unique in-game vehicle. Exclusive Mouse Droid: Spunky droid to join your adventures. Exclusive Collector's Edition Store: Unique in-game vendor with a dynamic assortment of items. A source claiming to have knowledge of EA's plans for Star Wars: The Old Republic tells Kotaku that pre-orders for the game will begin this Thursday, July 21 at 2am CST. 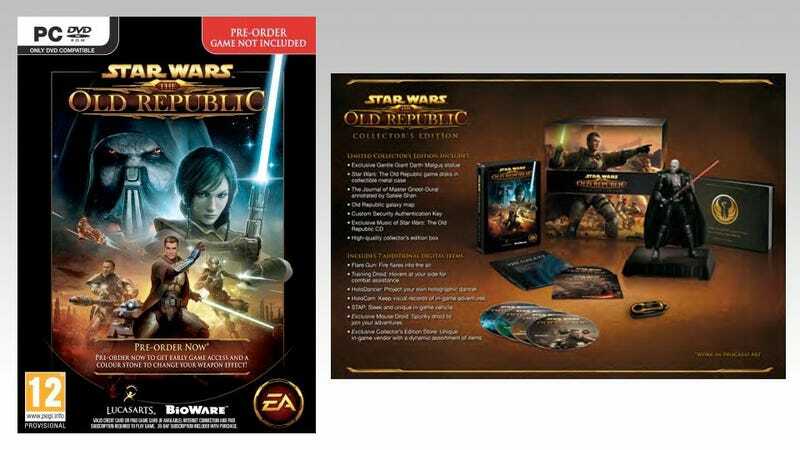 Pre-orders for The Old Republic will come in two flavors, the basic edition and the special Collector's Edition. The total number of pre-orders EA is purportedly taking caps out at 500,000, with only the first 50,000 pre-orders guaranteed, the rest queued in a prioritized waiting list. Those purchases will only be handled through EA's online store, Origin. Interested customers may want to make sure they have an Origin account in good standing prior to the pre-order launch if they're hungry for an early copy. Still no official release date, we're told—though one of the above European retailers has it listed shipping on November 25—but Star Wars: The Old Republic is still expected by end of year. Kotaku has contacted EA seeking clarification on its pre-order plans and the authenticity of the above artwork, but has not heard back. Consider these pre-order details unconfirmed until we hear it directly from EA. Expect more details on Star Wars: The Old Republic at Comic-Con later this week. Thanks, tipsters, for the heads up.